With few natural predators, the wildlife on this remote archipelago 600 miles off the coast of Ecuador shows little fear of humans. So, in contrast to jungles and savannahs elsewhere in the world, tourists can get up close and personal to the wildlife here, a particular delight for children. Although the Galapagos can be visited by any age group, for most visitors it's a once-in-a-lifetime experience—so you're better off waiting until your children are strong enough swimmers to fully take advantage of the fantastic opportunities in the ocean and old enough to have a developed a curiosity in ecology and geology. Note that many operators have a minimum age of 7 for children. On land, children will love to see the plodding giant tortoises and marine iguanas sunning themselves on rocks. On walking trails, there are ample chances to decide which bird's mating ritual is more amusing - the padding and marching of blue-footed boobies or frigatebirds inflating their red chests to the size of a basketball. In the waters, snorkeling with playful sea lion pups is a wonderful thrill and older children can seek out reef sharks (harmless to humans), rays and turtles. The Galapagos Islands can be visited year-round. The hottest season and also high season is December to April. This is the best time to visit with warmer, calmer seas. July-August is comfortably cool on land but cold seas mean swimming and snorkeling are less comfortable, especially for children. If you are not restricted to school vacations, then May is a quieter time to visit with good conditions. The biggest decision to make when visiting the Galapagos is whether to take a cruise or opt for a land-based tour with day trips. The advantages of a cruise is that you can see more, travel further and really immerse yourself in the islands away from the ports. There are also many sites that are only accessible to cruises, and not day tours. You sleep at sea and often move between sites in the evening to enable an early start. This suits many adults and may be a good option for teenagers too. However, the drawbacks are that it can be less comfortable unless you choose one of the most expensive luxury yachts, and children can be particularly prone to seasickness. The land-based options can be preferable for this reason and, while you can cover less of the islands, you can still see plenty, and the access to hotels and variation are better suited for younger families. On land-based tours, you'll sleep in hotels and take day trips in small yachts, returning to port in the late afternoon. Travel to the Galapagos requires the same vaccinations as mainland Ecuador because you must pass through Ecuador to get to the islands. Be sure to get typhoid, Hepatitis A, and Yellow Fever vaccinations. Note that water quality is no better on the Galapagos Islands than in mainland Ecuador, so do not drink from the faucet but use bottled water. 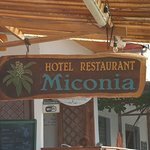 Eat in recommended places and in your hotel to avoid sickness. Take care in particular with shellfish or if your children have a sensitive stomach. Remember that the islands are on the Equator. Even though the climate is comparatively comfortable due to the cool ocean currents, the sun remains fiercely strong, especially at sea, so use plenty of sunscreen and ensure the whole family has hats and sunglasses. Many of the excursions involve swimming and snorkeling and be mindful of the currents. If your children are not strong swimmers then take care and always buddy up when snorkeling. It is recommended to familiarize yourself with the Galapagos National Park rules. Note that, although the various wildlife are friendly, you must never touch the animals. A distance of at least 6.5 feet (2 m) is recommended. The islands listed below have the most accessible sites that can be visited both on land-based tours and cruises. Note that the following islands can only be visited on cruises: the southern island of Española, the northern island of Genovesa and the western island of Fernandina. The remote northern islands of Darwin and Wolf, famous for hammerheads and whale sharks, are only visited by specialist dive boats. Many tours are based in the archipelago's biggest town, Puerto Ayora. The port is a delight to wander around, browsing the restaurants and encountering pelicans and sea lions on the fishing jetties. There are lots of family-friendly attractions in or near Puerto Ayora. 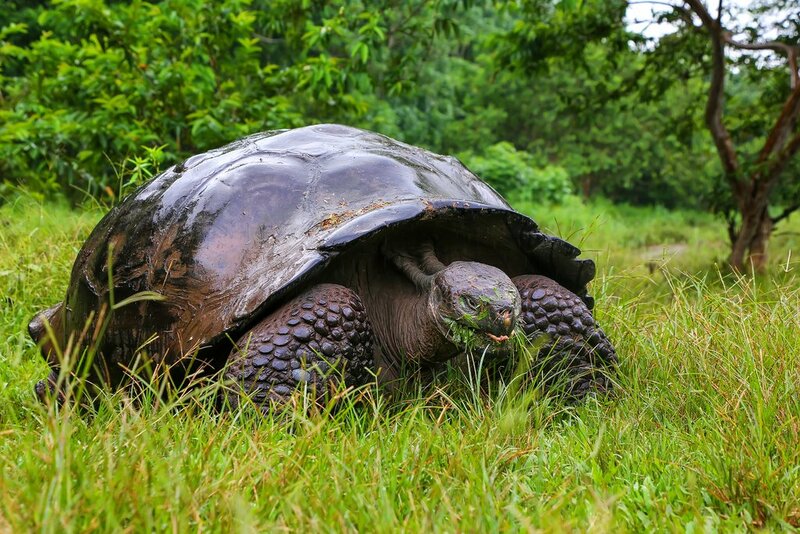 Charles Darwin Station, a 15-minute walk, is the best place to learn about the islands' history and see giant tortoises up close. 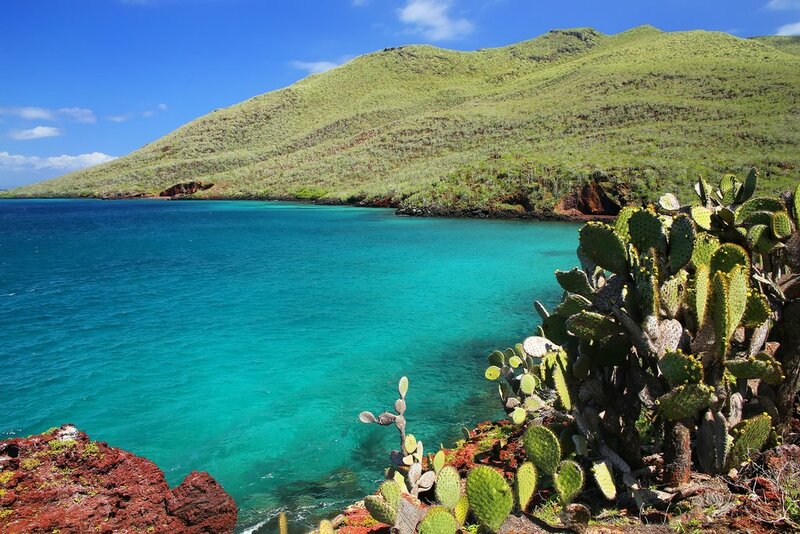 Tortuga Bay is one of the best beaches in the Galapagos, a 45-minute walk from town along a trail through cactus forest. There is great swimming in the sheltered bay at the end of the beach. You can also take a refreshing dip in the brackish waters of Las Grietas, a half-hour walk from the dock at Angermeyer Point. In the highlands of Santa Cruz, children will enjoy seeing Los Gemelos, 30-meter-deep craters, now covered in flora and fauna. 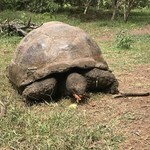 El Chato Tortoise Reserve is the best opportunity to see giant tortoises roaming in the wild. This site is usually combined with a visit to nearby Lava Tunnels, formed by the solidified outer skin of an ancient lava flow. The most popular day trips to small islands just off Santa Cruz include North Seymour, which has large populations of blue-footed boobies and frigatebirds. South Plazas is another great day trip with a sea lion population of over 1000, one of the biggest in the archipelago. Children will enjoy getting close (but not too close) to the mothers and pups—give the large males a wide berth as they are occasionally aggressive. A day trip to Santa Fé Island is good for snorkeling with opportunities to see rays, turtles, sea lions and reef sharks. The northern island of Santiago is a fascinating barren landscape filled with blackened lava trails, the best of which is Sullivan Bay. The tiny islet next to Santiago, Bartolomé, is the most visited and most photographed site here. The jagged lava formation of Pinnacle Rock and the twin half-moon-shaped beaches in the foreground make a perfect photograph. There is also good snorkeling with sea lions and penguins. This southern island contains the archipelago's capital, Baquerizo Moreno. It's a smaller town but charming, and there is a sea lion population that sleeps on the beach. Northeast of town is the Interpretation Center, which has a comprehensive history of the islands. Further up is Frigatebird Hill, which has a large nesting population. From here you can descend to Playa de Amor which has great swimming and snorkeling. South of town (10 minutes by taxi) is a large sea lion population as well as marine iguanas at La Lobería. By far the best day trip on the island is Isla Lobos and Kicker Rock. 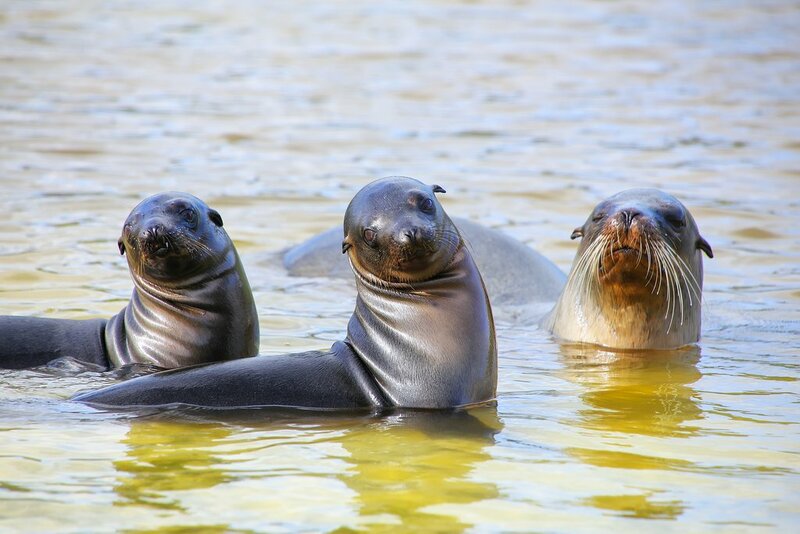 Isla Lobos is one of the best places on the islands to snorkel with playful sea lion pups, which may be the highlight of the trip for the kids. Further on, Kicker Rock (also known as Leon Dormido or Sleeping Lion) has a channel where reef sharks can commonly be seen. If you dive, then this is a great place to see hammerheads. Children will find the troubled history of this island fascinating. The first to be populated due to its water supply, Floreana was the scene of a mystery involving a German dentist, who ended up poisoned, and a Baroness who disappeared one night with her lover, never to be seen again. A visit to the island is far less mysterious nowadays and highlights include snorkeling at Devil's Crown (available only to cruises) and Champion Island, sea lions at La Lobería and the quirky Post Office Bay, where you can mail your own letter and children will enjoy the tradition of taking a letter or postcard back home to mail. The largest island in the archipelago is less visited and therefore quieter. Next to Puerto Villamil is Poza de los Diablos, a large lagoon filled with flamingos, while 20 minutes outside town there is a Tortoise Breeding Center. The best site nearby is Las Tintoreras, which offers great snorkeling and opportunities to see reef sharks, penguins, sea lions, and turtles. The geological highlight of the island is a hike to Sierra Negra, the second largest volcanic crater in the world. The shorter trek (four hours total) to the lava cones of Volcan Chico is probably more suited to children or you can tackle the six or seven-hour trek to the Sulphur Mines of the steaming volcano. If you're looking for even more insight on where to go, check out this guide. The best beach on Santa Cruz for relaxing is Playa Manso at Tortuga Bay, while the closest to town is Playa de los Alemanes, which can get busy in high season. On the northern coast of Santa Cruz, Bachas Beach is often included on day trips and still contains some of the rusty remnants of World War II military barges which were abandoned here. Its pristine white sand beach is very beautiful. On San Cristobal, Mann Beach is the closest to town but gets quite busy. Playa de Amor, also known as Playa Cabo de Horno, is far better. On Isabela, the main port Puerto Villamil has its own beach. 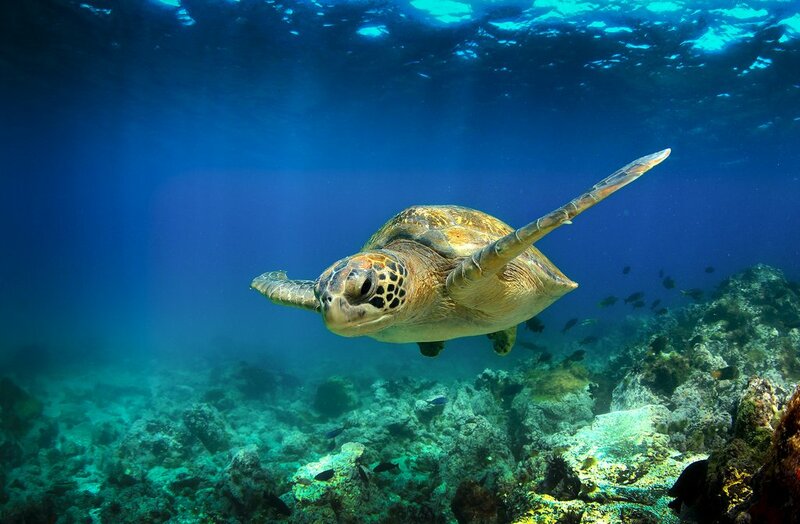 The Galapagos offer many fantastic opportunities to swim and snorkel with wildlife. Snorkeling is an integral part of most tours and it's warm from December to May, although from June to October waters can be cold. The best snorkeling spots to swim with wildlife include Santa Fé, Champion Island on Floreana, Isla Lobos and Kicker Rock on San Cristobal, Bartolomé, and Las Tintoreras on Isabela. The Galapagos has fantastic diving but you need to be qualified. Children can study the Junior PADI Open Water certificate from aged 10 and upgrade to the full Open Water certificate from aged 15. It is expensive and time-consuming to learn to dive on the Galapagos, so it's better to arrive qualified. Note that many sites are too advanced for children. If you're interested in learning more, read our Ultimate Guide to Diving in the Galapagos. The Galapagos contains some of the world's best birdwatching opportunities and you can get very close to birds with little fear of humans. Many types of finches can be found across the archipelago - these were the birds that inspired Darwin's theory of evolution when he observed how the different species adapted to their environment. 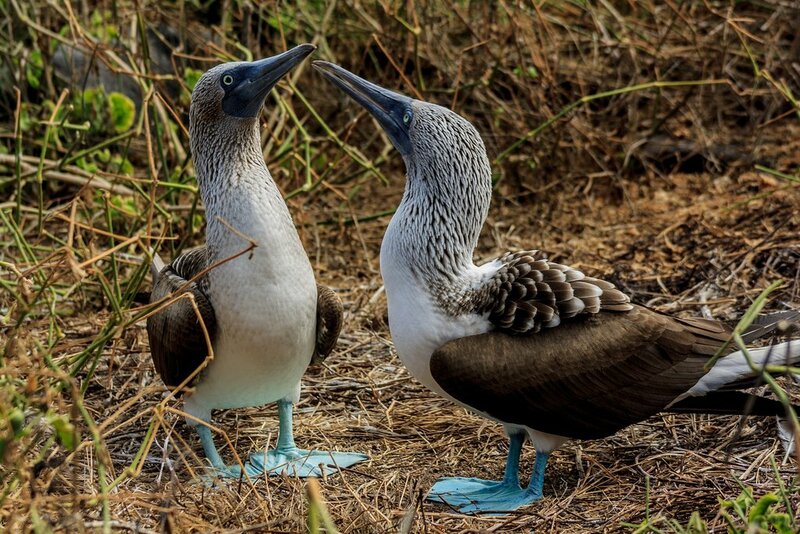 Blue-footed boobies are a highlight for many people and particularly likable, entertaining birds that march around trying to impress mates and peer at you curiously as you pass. Magnificent frigatebirds are impressive in a different way: the males sit on cliffs and branches, inflating their chest to the size of a basketball to attract mates. The albatrosses coming into land are a particular highlight but can only be seen on the southern island of Española. The Galapagos Penguin is among the smallest in the world and the only penguin found north of the Equator. It's a delight to encounter them while snorkeling or watch them sunning themselves on rocks. 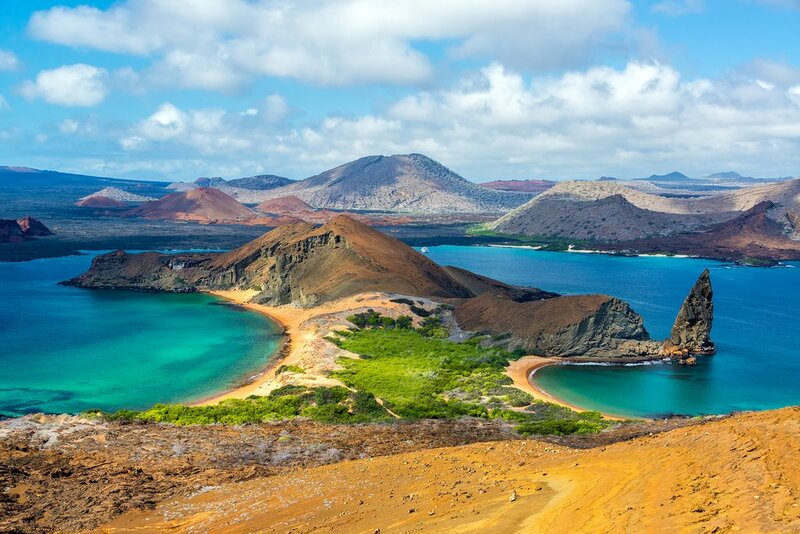 The Galapagos's unworldly volcanic landscapes are just another part of their appeal. The lack of fresh water deterred endemic larger species from thriving and enabled a unique ecosystem to flourish. The volcanic legacy is everywhere - from the lava tunnels and sunken craters on Santa Cruz to lava trails on Santiago, the submerged volcanic cone of Devil's Crown on Floreana, and the hike to Sierra Negra on Isabela. Children will be fascinated to walk in volcanic landscapes.